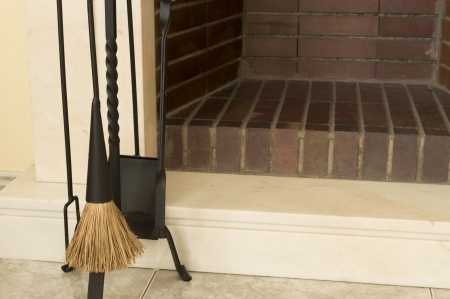 Floors, walls, and fireplaces made of brick are lovely to look at, until they're stained by grease or grunge, that is. Here's a simple way to remove dirt and dust and even clean brick of that unsightly grease buildup. Mix 2 tablespoons dishwashing liquid, a dash of table salt and enough water to make a smooth cleaning solution. Rub the solution into the grungy, greasy brick using a cloth or rag. Let stand for 10 minutes. Scrub the areas with a stiff-bristle brush. Rinse clean with warm water. If that doesn't work, try this stronger method. Using a stiff-bristle brush, scrub the surface with a cleaning solution of a half-cup Trisodium Phosphate (TSP) mixed in 1 gallon hot water in a plastic bucket. TSP is caustic and potentially dangerous, so follow the product's directions carefully and keep it away from children. Be sure to wear rubber or latex gloves, safety goggle and protective clothing. After scrubbing, rinse the area with warm water. Repeat if needed, adding up to another half-cup TSP to the cleaning solution, then rinse again with warm water.